After months (upon months) of hype, the big day finally arrived. The Super Bowl, sure — and, more to the point, the halftime show by Maroon 5. This one certainly generated its fair share of buzz before, during and after. So, did the show live up to the anticipation? We can say this much for sure: it boasted a few major moments. It’s also generating mixed reviews from football fans and music lovers alike. Here’s a full rundown of the highlights, in case you need help making up your mind about the performance. ICYMI, there’s an iconic episode of the Nickelodeon cartoon SpongeBob SquarePants during which SpongeBob and pals perform the song “Sweet Victory.” Prior to the Super Bowl, a petition began circulating for Maroon 5 to bring “Sweet Victory” to the halftime stage to honor SpongeBob creator Stephen Hillenburg, who died in November 2018. 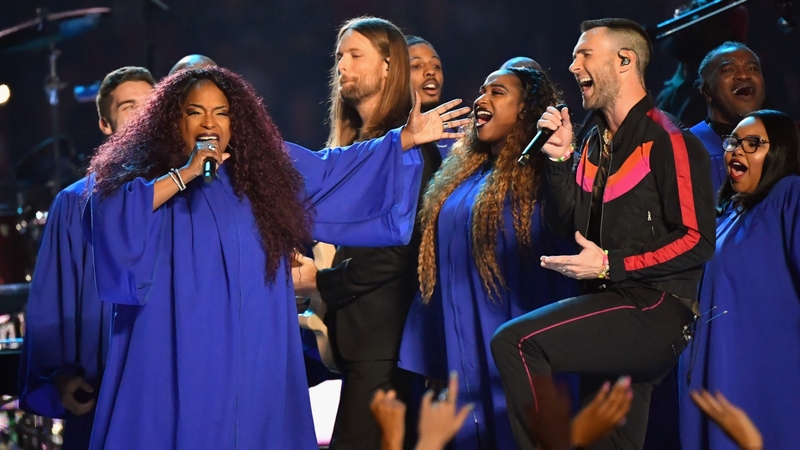 Maroon 5 made fans happy (if only for a moment) by responding to that petition during the halftime show. Just before Travis Scott came onto the stage, a clip from the episode in question played, essentially setting the scene. SpongeBob himself voiced his approval. After being introduced by SpongeBob, Travis Scott burst onto the fire-lit stage for his hit track “Sicko Mode.” Green lasers lit the way for the rapper, who clearly knows how to work a crowd. The energy he brought to the stage was practically palpable during his performance. In a super-brief but nevertheless standout moment, Atlanta native and former Outkast rapper Big Boi pulled up in a Cadillac and made his way to the stage in a massive fur coat to perform “I Like the Way You Move.” If fans had any complaints about this portion of the halftime show, it was simply that there should have been more of it. In what you might call the big finale, Levine stripped down to a tank top to sing the upbeat anthem “Sugar.” It didn’t take long for him to transition to the energetic “Moves Like Jagger,” though, at which point he ripped his tank off entirely to reveal his hot dad bod. Can we talk for a minute about how hot this halftime show was? Like, literally. Arguably the real star here was the metric ton of fireworks on display throughout Maroon 5’s performance. Given the sheer volume of sweat on Levine’s shirtless torso, we can’t even imagine what it must have felt like in Big Boi’s fur coat. What did you think of the performance? Did you have a favorite part?